A GAL NEEDS...: Tropical Traditions Virgin Palm Oil Giveaway! Tropical Traditions Virgin Palm Oil Giveaway! Congratulations to comment #168, Eve, who said, "tweet http://api.twitter.com/shopgurl/status/27695338454"
Palm oil is the #1 dietary oil in the world, except for the U.S., where soybean oil is the most widely used oil. Traditionally, palm oil has been used for baking, shortenings, margarines and deep-fat frying. It has a long shelf life without being hydrogenated and has zero trans fats! Today, Malaysia is the Word’s largest producer of oil from palm fruit, although it is native to West Africa. Being an introduced crop to Asia, they are mainly harvested from large plantations. Tropical Traditions Virgin Palm Oil is produced by small-scale family producers in Africa that are certified organic. When you purchase Tropical Traditions, you are supporting the small scale family farmers in Africa and NOT the large, corporate run plantations in Southeast Asia! Read about the history of Virgin Palm Oil here! The nutritional and health benefits of palm oil are staggering. It is 15 times richer in beta-carotene than carrot!. I wasn't sure that I would like this oil or not but I tried one of the recipes featured on Tropical Traditions using Palm Oil, the 'Orange Coconut Cookies', using orange zest and coconut. They were SO delicious! There are also recipes for Chops, Steak, and bread. I'm excited to try all of these and take advantage of the healthful benefits of this great oil! Right now you can purchase Organic Virgin Palm Oil at Tropical Traditions for half price! WIN A JAR of Tropical Traditions Organic Virgin Palm Oil! Please complete the mandatory entry before you do any of the other entries! This giveaway is open to US Residents, Canadian Residents, bloggers and non-bloggers. You must be able to have product mailed to a mailing address other than a P.O. Box and must have a valid e-mail address that I do not have to look high and low for. Good luck! MANDY: Visit Tropical Traditions and find one recipe that you'd like to try and tell me about it! +2 What is the strangest food you ever tried and ended up liking? +1 Follow Tropical Traditions on Twitter and tweet this..." #Win a jar of @TropTraditions Organic Virgin Palm Oil @Melahelen http://bit.ly/9c8JwF #Giveaway - 10/18/10" (Can be done 1x daily for one entry each!) Leave your tweet status! This giveaway will close on October 18, 2010 at 11:59 MST. 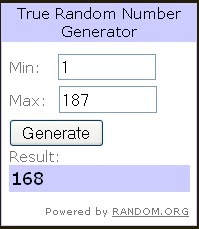 The winner will be chosen through random.org and notified by e-mail. The winner will have 48 hours to respond! Thanks for participating and thanks to Tropical Traditions for the chance to review and host this giveaway! The opinions in this blog are mine and are honest and candid! I was supplied with product to sample and review! I would love to try the chocolate coconut smoothie. I tried goose, and I didn't like I'd like it, but it was fantastic! I hope I win. From your review, it sounds delicious! I really want to try Banana Coconut Cream Bread. I won some of Tropical Traditions Coconut Flour and am eagerly waiting its arrival! The Gluten Free Coconut Flour Flax Bread looks and sounds wonderful! I used to work in an Immigrant and Refugee society here and we often had pot lucks. We had food from all over the world. We once had a graduation ceremony in China Town and I was seated beside a fella from China. We had ordered a fish and it came completely whole. I was shocked when he offered me the eye of the fish (a big honour in Chinese traditin). I was soo hesitant but didn't want to insult him, so I ate it......ahh lol......it wasn't that bad actually...it was just the thought of eating a fish eye...but I'd eat one again if offered. I want to try their pie crust. You can't write on Tropical Traditions wall?!?!? I would like to try the recipe for Virgin Palm Oil Bread. This summer my son made soft shelled blue crabs for me. It was strange because you eat the shell and all--it was delicious. Can you tell I don't live on the coast? I'd like to try the Gluten-free Yellow Cake recipe. Strangest food to me was nutritional yeast! I hated it at first, but now I love it! a strange food I like is goat meat. I tasted kidneys! And I actually liked it! its a bit sour but still was good in the soup.